Holidays are a' coming, and that means long hours travelling, killing time while your brother insists on watching that entire anime DVD box set he got for Christmas and maybe even keeping young humans entertained. 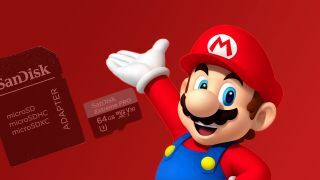 It also means now is the perfect time to upgrade your Nintendo Switch's paltry 32GB of internal memory with these one day only memory card deals. Be warned - the deals end tonight at UK midnight. These cards are from reputable brand SanDisk, so no worries on dodgy merchandise, and promise 170MB/s read and 90MB/s write speeds for fast loading. As a guide, the 64GB is about 6-7 full-sized games, and maybe 10-15 smaller indie titles. If you need somewhere to store your console and new SD cards, here's our guide to the best Nintendo Switch cases. Finally, if you're looking to subscribe, here are the best Nintendo Switch Online prices to start your subscription.